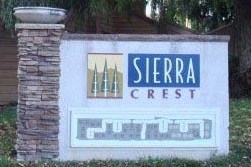 There are currently twenty-seven (27) Sierra Crest condos for sale in San Jose CA. Eleven (11) condos have 1 bedroom/1 bathroom with 658 square feet of living space. 73% of these units are short-sales; 9% are REO/ Bank-Owned; and the remaining 18% are normal sales. The median list price of these condos currently for sale in San Jose CA is $174,999 and the average list price is $176,167. Sixteen (16) of the Sierra Crest condos for sale in San Jose CA have 2 bedrooms/2 bathrooms with 922 square feet of living space. 88% of these larger condos are short-sales and the remaining 12% are REO/ Bank-Owned. There are no normal sales. The median list price of the units currently for sale is $240,000 and the average list price is $238,793. The Sierra Crest complex was originally constructed in the year 1988. It consists of 19 buildings with a total of 332 units. This complex is in a prime location, close to 280 and 17/880 freeways, shopping and restaurants (Santana Row and Westfield Valley Fair Mall) and hospital (Santa Clara Valley Medical Center).